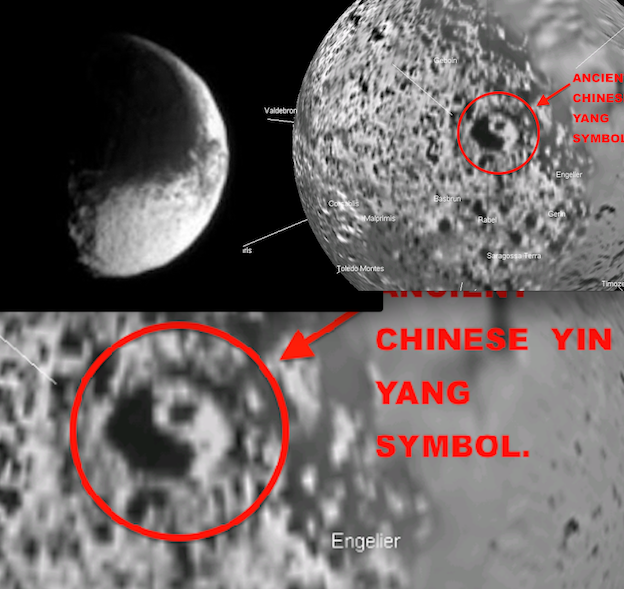 Two Matching Alien Symbols of Yin Yang...On Saturn Moon Iapetus, UFO Sightings Daily. You wont believe what I found today. Proof of an ancient alien symbol that goes back thousands of years here on Earth, but may go back billions on Saturns moon Iapetus. Back in 2012 I found a crater, but then realised it was a Yin-yang symbol. I had found it in two different photos, but this week I found that the entire moon itself is a Yin-yang symbol! Thats right. Aliens on Saturn believe so much in its meaning that they made the entire moon a symbol of their belief. The fact that this symbol was found not once, but twice in two different ways is 100% proof that aliens exist on Iapetus and Saturn. Also note, Iapetus may not be a real moon, but an artificially made station to appear as a moon, in order to not frighten lower level species. So the symbol Yin-yang is 3,000 years here on Earth, but goes back millions or billions of years on Iapetus and Saturn. This...changes world history forever!